We raise funds for underprivileged children such as Dalits (of the untouchables), Janajati (ethnic groups), religious minorities and others who are socially disadvantaged and who are as a result at risk of exploitation or in domestic child labour. Our child sponsorship programme give support for quality education, books, supplies, day food, and school uniforms the poorest schoolchildren, especially girls, who otherwise would have no access or opportunity to benefit from primary education. We believe that extreme poverty and gender inequality are the greatest barriers to girls attending school in Nepal. Our role is to create an environment to brings them back in school. 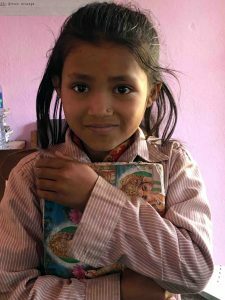 Sarita Praja (Marginalised Group) is 8 years old and is studying in class 3 in Barahi Primary School, Dhading and her parents work as stonebreakers on a nearby river bank – a poorly paid occupation. 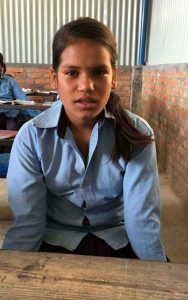 Sarita joined school but does not attend regularly due to lack of school uniform, stationary and day food although she is very keen to attend. 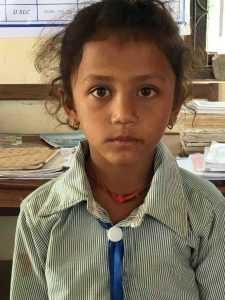 We calculate (Kadam Nepal) that it would cost about 200 US dollars for her to attend school for a year. Please help a donation to enable her attend school regularly. For further information or to make a donation please contact us. Sunita Mijar (Dalit) is 9 years old and is studying in class 3 in Saraswati Primary School, Dhading. Her parents are seasonal labourers whose incomes are not stable. Because of this they cannot afford her school uniform, books and stationary. If her parent can buy these Sunita attends school, otherwise she stays at home and does domestic chores. We calculate (Kadam Nepal) that it would cost about 200 US dollars for her to attend school for a year. Sunita is a Dalit (of the untouchable cast). She is active and learns fast and has many friends. Her aim to become a Doctor in future. If you would like to support her further education please contact us. Sanam Karki is 7 years old and is studying in class 3 in Harihar Bhojkumari Secondary School, Kewlapur, Dhading. Her father has separated and remarried so her care and education now lies solely with her maternal uncle. Due to a lack of suitable clothing and school supplies she cannot attend school often. 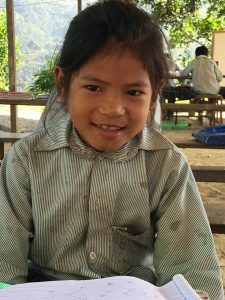 With support (of about 200 US dollars per year) covering her uniform, school supplies and a daily meal she would be able to go to school regularly would be able to continue with her education. Her aim is to become a teacher in future. If you would like to contribute please contact us we will assist her. 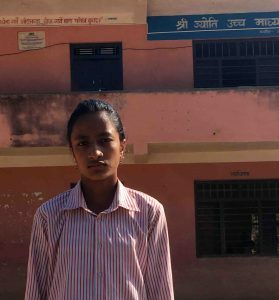 Bipina Mijar (Dalit) is 12 years old and is studying in class 5 in Bagh Bhairab Lower Secondary School, Dhading she walks 10 km every day in order to attend school. Her dream is to become a Teacher when she grows up. Bipina lives with her father and she also works as a casual labourer to earn money for her dress and stationaries. Her family’s income is unstable and is not adequate to provide her basic needs and her parents are worried about Bipina’s further schooling. Your sponsorship will change her entire life and can help her to fulfil her dream. Your support will cover her education, health care and clean water and will give her access to the necessities she needs to attend school such as her clothing, books and day food. Founded in 2016, Kadam Nepal is a non-governmental and non-political organization registered under the law of Nepal. Our aim is to support communities in Nepal with education and information on livelihoods and the health sector – covering preventative health, sanitation, hygiene, nutrition, preventable diseases as well as sexual and reproductive health. Kadam Nepal follows a participatory approach for its programme activities. A two room semi-permanent school block constructed in Bagh Bhairab Lower Secondary School, Kewalpur VDC, Dhading district and handed over to the School Management Committee.